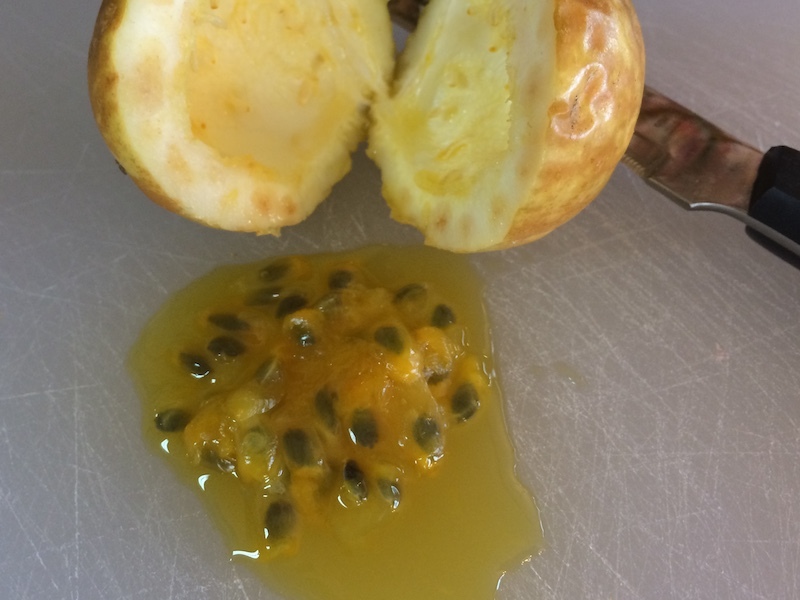 How do you eat passion fruit? Do you eat the seeds of a passion fruit? Is the whole passion fruit edible? How do you tell if a passion fruit is ripe? The answer, in basic form, is to cut it open and enjoy; but we will get into much more detail below. If you’ve been lucky enough to visit the 50th state, then chances are good that you’ve also fallen in love with passion fruit, or lilikoi in Hawaii. Although lilikoi are yellow, almost the entire crop sold in the rest of the United States have a deep violet or purple colored skin. They both have a great sweet/tart taste with lilikoi tending to be slightly less juicy and more acidic. This fruit is becoming more and more prevalent around the rest of the globe, which is why many questions surround the fruit. First, the history. Why is it called “passion” fruit? The un-romantic answer is that it’s a nod to religion and not love or passion. It seems that the passion flowers which grow on the vines of the plant are spiked and somehow reminded the 16th century missionaries of the passion of Christ. 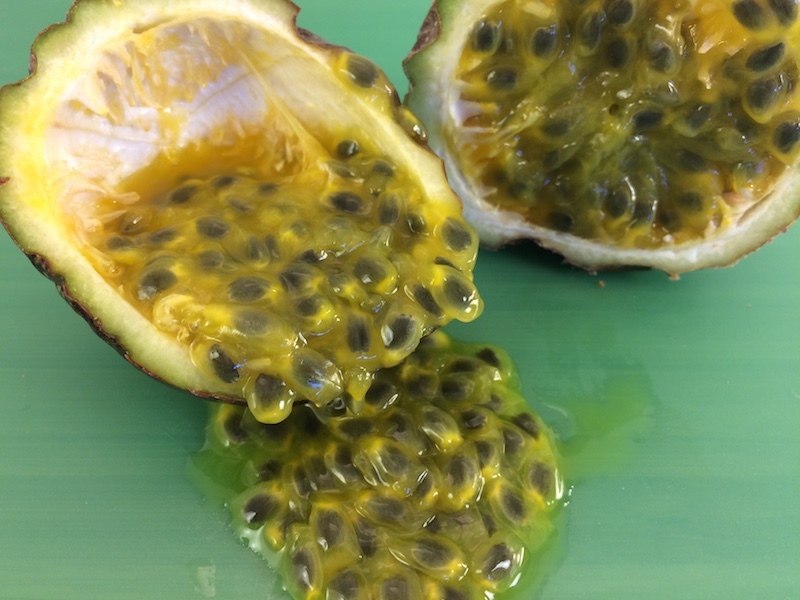 Is passion fruit new to the culinary scene? So, you’ve probably tasted a hint of it without even knowing. If you taste the juice straight (well, probably mixed with a little sugar and some water), you will know and remember the unique taste and chances are very high that you will also long for more. Next, how to ripen a passion fruit? Simply leave it out on the counter. The smooth skin will begin to darken and form wrinkles as the insides become sweeter. The fruit may have been pretty when you purchased it, but it tastes better when it looks a bit ugly! 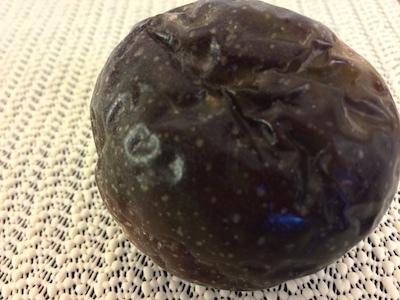 A passion fruit is best eaten when it is well aged, as seen by a skin that is full of wrinkles. This is the best time to cut it open. A ripe purple passion fruit is shown on the left and a ripe yellow passion fruit is shown on the right below. The fruit has a tart taste which some enjoy straight, but many prefer it with a little sugar added. The flesh, in the case of both purple and yellow passion fruits, will be a golden yellow with large black edible seeds. Shown below are the ones shown above cut in half. Passion fruits grow in tropical and sub-tropical areas including Brazil, Australia, New Zealand, Hawaii, Florida and California. This fruit is available pretty much all year round, but hard to find in most stores (see additional information below). Wash the fruit first and then cut it in half. Scoop out the seeds and the pulp with a spoon. Avoid the skin (all of the white interior) as that is very bitter. Eat it straight from the skin, blend it into juice, create delicious cocktails, spoon it over desserts, swirl it into creams and frostings, cook it into jams, stir it into marinades, mix it into salads and dressings… the possibilities are endless. Can you eat passion fruit seeds? Yes, the seeds are completely edible and should be eaten. However, you may want to strain them out with a fine strainer or cheesecloth if making a fancy drink or mousse. How much fruit do you get? Each passion fruit will contain only about 2 to 3 tablespoons of delicious pulp, so be careful to cut it open over a cutting board or bowl to avoid letting any juice escape. These fruits are for those who prefer quality to quantity in their food! Finally, how long does passion fruit last? 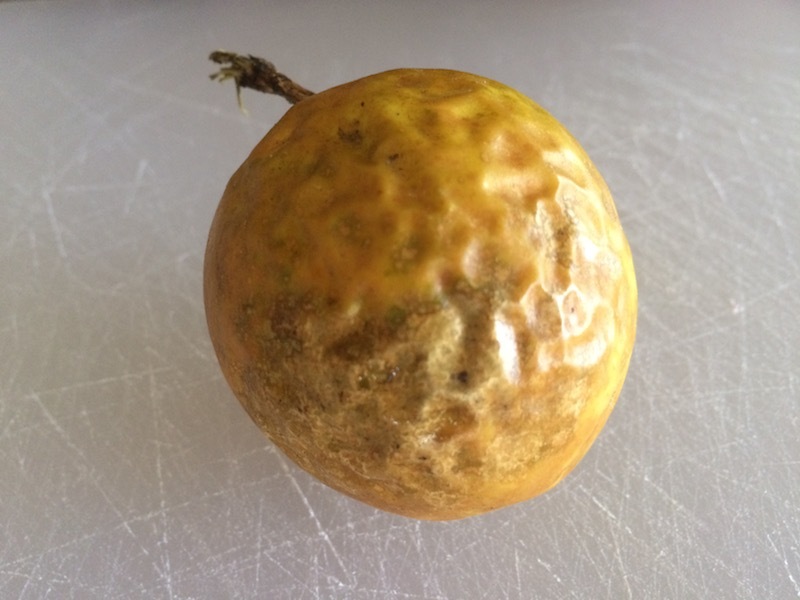 Passion fruits are actually one of the longer lasting fruits, to find out how long passion fruits last and how to tell if they have gone bad, see our passion fruit page. Can’t find the fresh fruit? You can sometimes find the pulp or puree in the freezer section where it is generally sold in bags or tubs. Since the fresh fruits are pricey, if your recipe needs a lot of fruit this could be the better way to go. If you just need the juice, then look for the boxes in the juice section – but finding straight passion fruit is difficult as it is more commonly sold in a juice blend. A great blend is called POG, a passion fruit, orange and guava juice blend that is pink, sweet and quite irresistible. Looking for a similar, but less expensive fruit? Maybe one that is a little more of a challenge to eat? Try a pomegranate.